And yet, only a handful of surviving diaries and journals record the thoughts of the multitude. One of these belongs to an unnamed daughter of Henry Howell Williams. It is a wonderfully chatty tome, full of insights into the activities of late 18th century Boston society. Williams and his extensive family lived on Noddles Island in Boston Harbor. By all accounts, Williams was a wonderful host who entertained regularly, and his extensive farm (as well as income from tenants and wide-ranging business interests) allowed his family a happy living. The island itself was a favorite resort in the summertime, and parties of picnickers and fishermen frequented its shores. 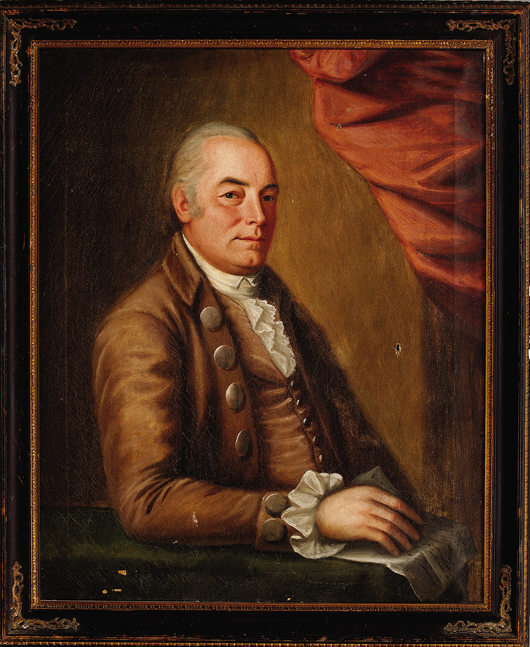 A portrait of Henry Howell Williams from about 1790, attributed to John Johnston. The portrait was sold by Neal Auctions in 2013. Williams had no direct role in Constitution’s construction, but he did own a wharf and land adjacent to Edmund Hartt’s shipyard. The government used it to store timber for the ship and paid Williams $392.56 in rent for the privilege. Williams’ daughter’s account of the ship’s launch captures the excitement of the day. Tuesday, 19th September, 1797. — . . . Before sunset the ferry-boat brought Mr. Hill and two daughters, Mrs. Mears, Mrs. Blany and daughter, Mrs. Thayer, cousin Susan and Martha, Sally, and Betsey Avery, to pass the night, to see the frigate launched on the morrow, etc. Wednesday, 20th. — Wind N. W., pleasant but cold. The company began to assemble early. A large number of our friends came over besides strangers. Papa thinks there were about six hundred on the Island, and one hundred that partook of a eleven o’clock and dined with us. There were Mr. Carey, wife and family; Mr. Avery, wife and family; Mr. Hill and family; Mr. Scott and two daughters; our friends and relations from Boston and Roxbury, too many to enumerate. Some left us after; had about forty to tea. These left us all but those who tarried last night, except Mrs. Blany and daughters; the Mr. Sigourneys went over this morn. Daniel (S.) came over with his mother. Andrew (S.) was to be launched in the frigate, but like ourselves and thousands of others, was disappointed as the vessel did not move more than eight feet before she stopped. The colors were then dropped as a signal she would not go off to-day, etc. Not to be deterred by the mishap, Naval Constructor George Claghorn tried again two days later. Friday, 22. — A fine day. Scott erected a tent again on the hill to accommodate those persons that come over to see the ship launched, as they intend to make another attempt to-day. A great number of people came over, but not as many we think, as on Wednesday, and again were disappointed as the vessel stuck, and could not possibly be got off. Several gentlemen called to take some refreshment. Noddles Island, as surveyed by William Taylor in 1801. The black rectangle marker “Mansion House” was Williams’ home. Camp Hill was the high prominence from which the guests watched the launch. Leventhal Map Collection, Boston Public Library. Disappointed indeed. This time, because of the tide and the need to adjust the launching ways, the next attempt had to wait a month. The dreary weather and the quickly fading novelty of the event tempered the spectator turnout and enthusiasm. Saturday, 21st October. — Wind east and rather cold. Papa and the boys went to Boston. At twelve o’clock we all paraded up the hill to see the ship-launch, as she was to make tryall for the third time. A great number of people collected on the wharf, and a few boats in the harbor; only one boat of people landed at the Island. At half-past twelve she went, and I think that every one that saw her must be gratified, as it was impossible for anything to go better, or look prettier. 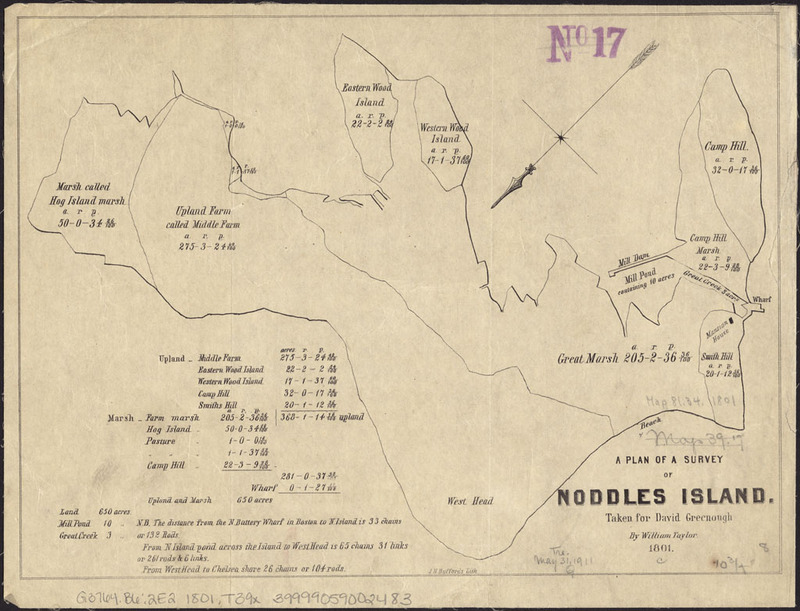 As a side note, when the Federal Government looked for a site for a new navy yard in Boston, Noddles Island was a top contender. In the end, however, landowners in Charlestown had a more effective lobby. Today, Noddles Island lies beneath the streets and avenues of East Boston, its hills long ago cut down as fill during late nineteenth century land-making projects. But you can still get a great view of the Boston skyline from there. Excerpts from the journal were transcribed in William H. Sumner’s A History of East Boston (Boston: J.E. Tildon and Co., 1858), 331-339.